"Morsi" redirects here. For other uses, see Morsy (disambiguation). Mohamed Morsi[note 1] (/ˈmɔːrsi/; Arabic: محمد محمد مرسي عيسى العياط‎, ALA-LC: Muḥammad Muḥammad Mursī ʿĪsā al-ʿAyyāṭ, IPA: [mæˈħæmmæd mæˈħæmmæd ˈmoɾsi ˈʕiːsæ (ʔe)l.ʕɑjˈjɑːtˤ]; born 8 August 1951) is an Egyptian politician who served as the fifth President of Egypt, from 30 June 2012 to 3 July 2013, when General Abdel Fattah el-Sisi removed Morsi from office in the 2013 Egyptian coup d'état after the June 2013 Egyptian protests. As president, Morsi issued a temporary constitutional declaration in late November that in effect granted him unlimited powers and the power to legislate without judicial oversight or review of his acts as a pre-emptive move against the expected dissolution of the second constituent assembly by the Mubarak-era judges. The new constitution that was then hastily finalised by the Islamist-dominated constitutional assembly, presented to the president, and scheduled for a referendum, before the Supreme Constitutional Court could rule on the constitutionality of the assembly, was described by independent press agencies not aligned with the regime as an "Islamist coup". These issues, along with complaints of prosecutions of journalists and attacks on nonviolent demonstrators, led to the 2012 Egyptian protests. As part of a compromise, Morsi rescinded the decrees. In the referendum he held on the new constitution it was approved by approximately two thirds of voters. On 30 June 2013, protests erupted across Egypt, in which protesters called for the president's resignation. In response to the events, Morsi was given a 48-hour ultimatum by the military to meet their demands and to resolve political differences, or else they would intervene by "implementing their own road map" for the country. He was unseated on 3 July by a military coup council consisting of Defense Minister Abdel Fattah el-Sisi, opposition leader Mohamed ElBaradei, the Grand Imam of Al Azhar Ahmed el-Tayeb, and Coptic Pope Tawadros II. The military suspended the constitution and appointed the President of the Supreme Constitutional Court of Egypt Adly Mansour as the interim-president. The Muslim Brotherhood protested against the military coup, but the pro-Morsi protests were crushed in the August 2013 Rabaa massacre in which at least 817 civilians were killed. Opposition leader Elbaradei quit in protest of the massacre. Since his overthrow, Egyptian prosecutors have charged Morsi with various crimes and sought the death penalty, a move denounced by Amnesty International as "a charade based on null and void procedures." His death sentence was overturned in November 2016, so he will receive a retrial. However, Morsi is still currently imprisoned. While living in the United States, Morsi became an assistant professor at California State University, Northridge from 1982 to 1985. Morsi, an expert on precision metal surfaces, also worked with NASA in the early 1980s, helping to develop Space Shuttle engines. In 1985, Morsi quit his job at CSUN and returned to Egypt, becoming a professor at Zagazig University, where he was appointed head of the engineering department. Morsi was a lecturer at Zagazig University's engineering department until 2010. Morsi was first elected to parliament in 2000. He served as a Member of Parliament from 2000 to 2005, officially as an independent candidate because the Brotherhood was technically barred from running candidates for office under Mubarak. He was a member of the Guidance Office of the Muslim Brotherhood until the founding of the Freedom and Justice Party in 2011, at which point he was elected by the MB's Guidance Office to be the first president of the new party. While serving in this capacity in 2010, Morsi stated that "the two-state solution is nothing but a delusion concocted by the brutal usurper of the Palestinian lands." Morsi condemned the September 11 attacks as "horrific crime against innocent civilians". However, he accused the United States of using the 9/11 attacks as a pretext for invading Afghanistan and Iraq, and claimed that the US had not provided "evidence" that the attackers were Muslims. He also stated that the aircraft collision alone did not bring down the World Trade Center, suggesting something "happened from the inside." Such views are held by most Egyptians, including Egyptian liberals. His comments drew criticism in the United States. Morsi was arrested along with 24 other Muslim Brotherhood leaders on 28 January 2011. He escaped from prison in Cairo two days later. The break of Wadi el-Natroun Prison received widespread news coverage within hours of its occurrence, with some reports indicating the political prisoners were sprung from detention by "armed gangs" taking advantage of the chaos of the Egyptian Revolution. Four years later, Morsi faced trial for his role in the prison break. He and 105 others were sentenced to death on 16 May 2015. The court of cassation overturned the death sentence on Morsi and five others and then ordered retrials. After Khairat El-Shater was disqualified from the 2012 presidential election, Morsi, who was initially nominated as a backup candidate, emerged as the new Muslim Brotherhood candidate. His campaign was supported by well-known Egyptian cleric Safwat Hegazi at a rally in El-Mahalla El-Kubra, the epicentre of Egyptian worker protests. Following the first round of Egypt's first post-Mubarak presidential elections where exit polls suggested a 25.5 percent share of the vote for Morsi, he was officially announced as the president on 24 June 2012, following a subsequent run-off vote. Morsi supporters in Cairo's Tahrir Square celebrated, and angry outbursts occurred at the Egypt Election Authorities press conference when the result was announced. He came in slightly ahead of former Mubarak-era prime minister Ahmed Shafik and has been noted for the Islamist character of his campaign events. Since the initial round of voting on 23 May and 24 May 2012, Morsi had attempted to appeal to political liberals and minorities while portraying his rival Ahmed Shafik as a holdover from the Mubarak-era of secular moderation. On 30 May 2012, Morsi filed a lawsuit against Egyptian television presenter Tawfiq Okasha, accusing him of "intentional falsehoods and accusations that amount to defamation and slander." According to online newspaper Egypt Independent, an English-language subsidiary of Egyptian daily Al-Masry Al-Youm, Okasha spent three hours on 27 May 2012, criticizing the Muslim Brotherhood and Morsi on air. After Okasha aired a video allegedly depicting Tunisian Islamist extremists executing a Christian while asking "how will such people govern? ", some analysts suggested that this was in reference to Morsi's Muslim Brotherhood party. The Tunisian government characterized the video as a farce in a harshly worded statement. On 24 June 2012, Morsi was announced as the winner of the election with 51.73 percent of the vote. Almost immediately afterward, he resigned from the presidency of the Freedom and Justice Party. I hope the people will choose me, an Islamist candidate from the Freedom & Justice party and Muslim Brotherhood, and God willing the system will move towards stability and development. Morsi said "no entity will be above the constitution" but did not spell out his vision for the army's status. He said the army's budget should be overseen by parliament but there would be a need for secrecy in specific areas. He promised to respect the Constitution of Egypt and said the Freedom & Justice Party would not "impose what we believe on people." He said Egyptians sought to live in a society in which all had equal rights. He also linked the 2011 revolution to an "Islamic awakening" in the Middle East. Morsi said Coptic Christians "are certainly just as Egyptian as I am, and have as much a right to this homeland as I do." He said freedom of religion is a right granted by Allah and sharia commands Muslims to respect the rights of non-Muslim compatriots. Morsi also compared free markets to the Islamic system, but said Islam requires there to be an ethical component to ensure that the poor share in society's wealth. Morsi was sworn in on 30 June 2012, as Egypt's first democratically elected president. He succeeded Hosni Mubarak, who left the office of the President of Egypt vacant after being forced to resign on 11 February 2011. Morsi reconvened Parliament in its original form on 10 July 2012; this was expected to cause friction between him and the military officials who dissolved the legislature. Morsi sought to influence the drafting of a new constitution of Egypt, favoring a constitution that protects civil rights and enshrines Islamic law. In a speech to supporters in Cairo's Tahrir Square on 30 June 2012, Morsi briefly mentioned that he would work to free Omar Abdel-Rahman, convicted of the 1993 bombing of the World Trade Center in New York City, along with the many Egyptians who were arrested during the revolution. A Brotherhood spokesperson later said that the extradition was for humanitarian reasons and that Morsi did not intend to overturn Abdel-Rahman's criminal convictions. On 10 July 2012, Morsi reinstated the Islamist-dominated parliament that was disbanded by the Supreme Constitutional Court of Egypt on 14 June 2012. According to Egypt's official news agency, Morsi ordered the immediate return of legislators elected in 2011, a majority of whom are members of Morsi's Freedom and Justice Party and other Islamist groups. A Morsi spokesman announced that the president-elect would appoint a Christian and a woman as vice-presidents, but eventually appointed Mahmoud Mekki, a Muslim man. On 22 December 2012, Mekki resigned. After Kamal Ganzouri's resignation, Morsi tasked Hesham Qandil with forming the new government. On 2 August 2012, Qandil was sworn in as prime minister. Morsi also objected to a constitutional provision limiting presidential power. Then President Mohamed Morsi (right) and General al-Sisi (left) listen to visiting U.S. Secretary of Defense Chuck Hagel (center), during a meeting with U.S. officials on April 24, 2013. Al-Sisi, chosen by Morsi to be the first post-Mubarak era Defense Minister, would later sanction the removal of Morsi. On 12 August 2012, Morsi asked Mohamad Hussein Tantawi, head of the country's armed forces, and Sami Hafez Anan, the Army chief of staff, to resign. He also announced that the constitutional amendments passed by the Supreme Council of the Armed Forces (SCAF) restricting the president's powers would be annulled. Morsi's spokesman, Yasser Ali, announced that both Tantawi and Anan would remain advisers to the president. Morsi named Abdel Fattah el-Sisi, who was then serving as chief of military intelligence, as Egypt's new defense minister. The New York Times described the move as an "upheaval" and a "stunning purge", given the power that SCAF had taken after the fall of Mubarak. Al Jazeera described it as "escalating the power struggle" between the president and military. On 14 August 2012, Mohamed Salem, an Egyptian lawyer, filed a legal challenge over Morsi's removal of Tantawi and Anan, arguing that Morsi planned to bring back the totalitarian regime. Morsi fired two more high-rank security officials on 16 August 2012: intelligence chief Murad Muwafi the Director of the Intelligence Directorate and the commander of his presidential guards. On 27 August 2012, Morsi named 21 advisers and aides that included three women and two Christians and a large number of Islamist-leaning figures. He also appointed new governors to the 27 regions of the country. In October 2012, Morsi's government unveiled plans for the development of a major economic and industrial hub adjoining the Suez Canal. Funding commitments had been received including $8 billion from Qatar. The European Bank for Reconstruction and Development committed €1 billion. On 19 March 2013 on a visit to India, Morsi sought support from India's Prime Minister Manmohan Singh. Although the project did not proceed under Morsi, his successor Abdel Fattah el-Sisi revived and launched a streamlined version of the corridor in conjunction with an expansion of the Suez Canal in August 2014. On 19 October 2012, Morsi traveled to Egypt's northwestern Matrouh in his first official visit to deliver a speech on Egyptian unity at el-Tenaim Mosque. Immediately prior to his speech he participated in prayers there where he openly mouthed "Amen" as cleric Futouh Abd Al-Nabi Mansour, the local head of religious endowment, declared, "Deal with the Jews and their supporters. Oh Allah, disperse them, rend them asunder. Oh Allah, demonstrate Your might and greatness upon them. Show us Your omnipotence, oh Lord." The prayers were broadcast on Egyptian state television and translated by MEMRI. Originally MEMRI translated the broadcast as "Destroy the Jews and their supporters. Oh Allah, disperse them, rend them asunder," but later revised their translation. Morsi did not attend the enthronement of Coptic Pope Tawadros II on 18 November 2012 at Abbasiya Cathedral, though Prime Minister Hesham Qandil did attend. On 22 November 2012, Morsi issued a declaration purporting to protect the work of the Constituent Assembly drafting the new constitution from judicial interference. In effect, this declaration immunised his actions from any legal challenge. The decree states that it only applies until a new constitution is ratified. The declaration also requires a retrial of those accused in the Mubarak-era killings of protesters, who had been acquitted, and extends the mandate of the Constituent Assembly by two months. Additionally, the declaration authorizes Morsi to take any measures necessary to protect the revolution. Liberal and secular groups walked out of the constitutional Constituent Assembly because they believed that it would impose strict Islamic practices, while members of the Muslim Brotherhood supported Morsi. The move was criticized by Mohamed ElBaradei who said Morsi had "usurped all state powers and appointed himself Egypt's new pharaoh". The move led to massive protests and violent action throughout Egypt, with protesters erecting tents in Tahrir Square, the site of the protests that preceded the resignation of Hosni Mubarak. The protesters demanded a reversal of the declaration and the dissolution of the Constituent Assembly. Those gathered in the square called for a "huge protest" on 27 November. Clashes were reported between protesters and police. The declaration was also condemned by human rights groups such as Amnesty International, Human Rights Watch and Freedom House. Egypt's highest body of judges decried the ruling as an "unprecedented assault on the independence of the judiciary and its rulings". Abdel Meguid Mahmoud, a prosecutor appointed by Hosni Mubarak, declared the decree "null and void." Morsi further emphasized his argument that the decree is temporary, and said he wanted dialog with the opposition. Morsi's statement failed to appease either the judges or citizenry dissatisfied with his decision and sparked days of protests in Tahrir Square. Though the declarations's language had not been altered, Morsi agreed to limit the scope of the decree to "sovereign matters" following four days of opposition protests and the resignation of several senior advisers. Morsi's spokesman said an agreement, reached with top judicial authorities, would leave most of the president's actions subject to review by the courts, but preserve his power to protect the Constituent Assembly from being dissolved by the courts before it had finished its work. President Morsi also agreed there would be no further retrials of former officials under Hosni Mubarak, unless new evidence was presented. On 1 December 2012, the Constituent Assembly handed the draft constitution to Morsi, who announced that a constitutional referendum would be held on 15 December 2012. On 4 December 2012, Morsi left his presidential palace after a number of protesters broke through police cordons around the palace, with some climbing atop an armored police vehicle and waving flags. On 8 December 2012, Morsi annulled his decree that had expanded his presidential authority and removed judicial review of his decrees, an Islamist official said, but added that the effects of that declaration would stand. A constitutional referendum was still planned for 15 December. George Isaac of the Constitution Party said that Morsi's declaration did not offer anything new, the National Salvation Front rejected it as an attempt save face, and the 6 April Movement and Gamal Fahmi of the Egyptian Journalists Syndicate said the new declaration failed to address the "fundamental" problem of the nature of the Assembly that was tasked with drafting the constitution. Khaled al-Qazzaz was the secretary on foreign relations from 2012 to 2013 in the Morsi government. Morsi's first official foreign visit was to Saudi Arabia on 11 July 2012. During this visit, Morsi stated that he intends to strengthen ties with the oil-rich monarchy, which also maintained close ties with the Mubarak government. Morsi has seen strong support from Qatar, which has maintained long-held ties with the Muslim Brotherhood, of which Morsi was a member until his election. Qatar has declared that it would provide Egypt with US$2 billion just as Morsi announced the reshuffle in the cabinet on 12 August 2012. Meanwhile, investors from Qatar have pledged to invest 10 billion in Egyptian infrastructure. As a staunch supporter of the opposition forces in the Syrian Civil War, Morsi attended an Islamist rally on 15 June 2013, where Salafi clerics called for jihad in Syria and denounced supporters of Bashar al-Assad as "infidels." Morsi, who announced at the rally that his government had expelled Syria's ambassador and closed the Syrian embassy in Cairo, called for international intervention on behalf of the opposition forces in the effect of an establishment of a no-fly zone. Although he did not explicitly call for Egyptians to join the opposition armed forces in the Syrian conflict, Morsi's attendance at the 15 June rally was seen by many to be an implicit nod-of-approval for the Islamist clerics' calls for jihad in Syria. Morsi was criticized by Egyptian analysts for attending and speaking at the rally, while the Supreme Council of the Armed Forces (SCAF) released a statement the day after the rally saying that its only role is to protect Egypt's borders, in an apparent ruling out of support for intervention in Syria. Morsi's attendance at the rally was later revealed to be a major factor in the largely secular SCAF's decision to side with anti-Morsi protesters over the Morsi government during the widespread June 2013 anti-Morsi protests. Up to 100,000 Syrian refugees arrived in Egypt following Morsi's inauguration as president. The government under Morsi also supported Syrian refugees living in Egypt by offering residency permits, assistance on finding employment, allowing Syrian refugee children to register in state schools and access to other public services. During his tenure, Morsi strengthened ties with Iran following pre-revolutionary years of animosity between the two countries. However, his actions were met with Sunni Muslim opposition both inside and outside Egypt. In October 2012, Morsi wrote a friendly letter to then Israeli president Shimon Peres. The letter largely followed standard diplomatic language. Morsi called Peres "a great and good friend" and went on to call for "maintaining and strengthening the cordial relations which so happily exist between our two countries." Morsi closed the letter by expressing "highest esteem and consideration." Gamal Muhammad Heshmat asserted that the letter was "fabricated" saying that "Zionist media have leaked baseless statements by Morsi in the past." However, Morsi spokesman Yasser Ali told Egyptian state-run newspaper Ahram that the letter was "100 percent correct". Previously, in July 2012, Morsi had refuted a fabricated letter. Morsi said in his victory speech that he would honor all of Egypt's international treaties, which was thought to be a reference to Egypt's treaty with Israel. Morsi's government condemned the Operation Pillar of Defense and called for a ceasefire. Morsi sent Prime Minister Hesham Qandil to Gaza to express solidarity with Gaza and Hamas, a stark contrast to Hosni Mubarak's treatment of Hamas as an enemy in the 2008–09 Gaza War. Egypt, along with the United States mediated the ceasefire with Hamas and Israel. Morsi told the delegation he was committed to freedom of religion and belief, his spokesman said, adding: "his Excellency [Morsi] pointed out the need to distinguish between the Jewish religion, and those who belong to it, and violent actions against defenseless Palestinians." During a visit to Germany in January 2013, Morsi again stated that his remarks were taken out of context, insisting that they were intended as a criticism of Israel's policies toward the Palestinians. Addressing reporters, Morsi stated that "[I am] not against the Jewish faith or the Jewish people. My comments were about conduct that sheds blood and kills innocent people – things neither I... nor anyone condones... My comments were about the conduct and manners, the killings and the aggression by tanks and warplanes and cluster bombs and internationally banned weapons against innocent people." Morsi also stated that, "[I] cannot be against the Jewish faith or Jews or Christianity and Christians," pointing out that the Quran requires Muslims "to believe in all religions."". Morsi attended the African Union Summit in Addis Ababa from 15 to 16 July 2012; this was the first visit to Ethiopia by Egypt's president in 17 years since the attempted assassination of Hosni Mubarak in June 1995. Later, in June 2013, politicians called by Morsi were overheard suggesting attacking Ethiopia to stop it from building a dam on a Nile tributary. Morsi attended the 16th Summit of the Non-Aligned Movement in Tehran at the end of August 2012, in a visit that could resume normal relations for the countries. Their diplomatic relationship has been strained since Egypt signed a peace treaty with Israel in 1979. Morsi made a speech against the Syrian government and called on the Syrian opposition to unite during the Syrian Civil War. His comments about Syria, however, were not covered by Iranian media clearly. He sparked controversy saying that it is an "ethical duty" to support the Syrian people against the "oppressive regime" in Damascus. Morsi hosted the Islamic summit in Cairo with the presence of 57 leaders of Muslim nations. The summit called for a "serious dialogue" between Syria's government and an opposition coalition on a political transition to put an end to the devastating civil war. Morsi awarded Ekmeleddin İhsanoğlu the Secretary-General of the Organisation of Islamic Cooperation (OIC), Order of the Nile, which is Egypt's highest state honor. On 30 June 2013, millions of people rallied across Egypt calling for President Morsi's resignation from office. Concurrently with these anti-Morsi demonstrations, his supporters held a sit-in in Rabaa Al-Adawiya square. On 1 July, the Egyptian Armed Forces issued a 48-hour ultimatum that gave the country's political parties until 3 July to meet the demands of the Egyptian people. The Egyptian military also threatened to intervene if the dispute was not resolved by then. Four Ministers also resigned on the same day, including tourism minister Hisham Zazou, communication and IT minister Atef Helmi, state minister for legal and parliamentary affairs Hatem Bagato and state minister for environmental affairs Khaled Abdel Aal, leaving the government with members of the Muslim Brotherhood only. On 2 July, President Morsi publicly rejected the Egyptian Army's 48-hour ultimatum and vowed to pursue his own plans for national reconciliation and resolving the political crisis. On 3 July, Abdul Fatah al-Sisi announced a road map for the future, removing Morsi from office and appointed Adly Mansour, the head of the Constitutional Court, the Interim President of Egypt. On 8 July, Prime Minister Qandil, after initially deciding to remain in his position until the formation of a new government, submitted his resignation effective immediately in protest of the subsequent bloodshed to the recent coup d'état when 51 protesters were killed by the military at the Republican Guard headquarters. In mid-November, Morsi claimed that he was kidnapped and held in a Republican Guard house on 2 July. He said that he had been kept there until 5 July and forcibly moved again to a naval base where he spent the next four months. The spokesperson of the Egyptian Armed Forces, Colonel Ahmed Ali, later denied the rumors that Morsi was badly treated, saying that they had nothing to hide. The Egyptian Army later gave Catherine Ashton the High Representative of the Union for Foreign Affairs and Security Policy for the European Union the permission to meet Morsi. Ashton later stated that Morsi is doing well, saying "Morsi was keeping up with the latest developments in the country through television and newspapers. So we were able to talk about the situation, and we were able to talk about the need to move forward. The people around him do care for him. I looked at the facilities." Morsi could later meet an African Union delegation too. After his overthrow, Morsi faced several charges including inciting the killing of opponents protesting outside his palace, espionage for foreign militant groups including Hamas, Hezbollah and Iran's Revolutionary Guards, for escaping Wadi el-Natroun Prison during the 2011 revolution prior to his election as president, leaking classified documents to Qatar, in addition to "insulting the judiciary". On 1 September 2013, prosecutors referred Morsi to trial on charges of inciting deadly violence. The date was set for 4 November 2013. Morsi was to be tried in a criminal court for inciting his supporters to kill at least 10 opponents, use violence and torture protesters. The prosecutors' investigation revealed that Morsi had asked the Republican Guard and the minister of interior to break up his opponents' sit-in but they refused, fearing a bloody result before Morsi's aides asked his supporters to break up the sit-in with force. On 18 December 2013, Prosecutor General Hisham Barakat ordered the referral of Morsi to criminal court on charges of espionage, in a report headed "The Biggest Case of Espionage in the History of Egypt". According to the Prosecutor General's investigations, the international organisation of the Muslim Brotherhood, aided by Hezbollah and Hamas, is the reason behind violence inside Egypt; members intend to create a state of ultimate chaos after receiving media and military training in the Gaza and aim to implement jihadists in Sinai. On 29 January 2014, Morsi faced trial for the second time on the charge of breaking out of jail during the Egyptian Revolution of 2011, after conspiring with foreign militant groups, including Hamas, to spread violent chaos throughout Egypt. The trial was postponed for a month On 1 February 2014, and was resumed on charges of inciting deadly violence. The trial was adjourned to the next day to hear witnesses for the prosecution, and was then repeatedly postponed. In April 2015, the court convicted Morsi, along with 12 other defendants, including former MP Mohamed Beltagy, for the arrest and torture of protesters and incitement to violence. All defendants were acquitted of murder charges. The judge handed down 20-year sentences for Morsi and the others who were convicted. Morsi still faced separate trials for espionage, terrorism, and prison-break charges and was sentenced to death on 16 May along with other defendants. The death penalty was imposed on Morsi and 105 others for their role in the Wadi el-Natrun prison break of January 2011. In accordance with Egypt's penal code, the sentence was referred to the Grand Mufti, whose assent or dissent is legally non-binding. Amnesty International denounced the court process as "a charade based on null and void procedures." Turkish President Recep Tayyip Erdogan criticized Egypt and accused Western countries of hypocrisy, "While the West is abolishing the death penalty, they are just watching the continuation of death sentences in Egypt." In June 2016, Morsi was given a life sentence for passing state secrets to Qatar. He is one of the defendants in the case along with two Al-Jazeera journalists who had been sentenced to death in absentia. In November 2016, the court of cassation overturned Morsi's death penalty on the spying charges together with those on five other Muslim Brotherhood members. The same court was to review two other charges against Morsi for his role in the January 2011 prison break as well as for allegedly providing classified information to the government of Qatar. A Detention Review Panel, consisting of UK MPs and senior lawyers, including MP Crispin Blunt, Lord Edward Faulks and MP Paul Williams, have reviewed Morsi's detention conditions. Based on the testimonies of Morsi's family and others informed of his condition, the panel has called his treatment "cruel, inhuman and degrading" and said it could "meet the threshold for torture in accordance Egyptian and international law". According to his sons, his health has deteriorated significantly since his imprisonment. Morsi married his cousin, Naglaa Ali Mahmoud, in 1979. She reportedly stated that she did not want to be referred to as "First Lady" but rather as "First Servant [of the Egyptian public]". Morsi has five children: Ahmed Mohammed Morsi, who is a physician in Saudi Arabia; Shaima, a graduate of Zagazig University; Osama, an attorney; Omar who has a bachelor in commerce from Zagazig University; and Abdullah, a high-school student. Two of Morsi's five children were born in California and are U.S. citizens by birth. Morsi has three grandchildren. His third son, Omar, was appointed to the Holding Company for Airports, a state-owned company, six months after his graduation. However, he declined the job offer due to many rumors and attacks in the media and press. On his first state visit to Pakistan, Morsi was awarded an honorary Doctorate of Philosophy (PhD) by National University of Sciences and Technology (NUST) in Islamabad, Pakistan on 18 March 2013 in recognition of his achievements and significant contributions towards the promotion of peace and harmony in the world and strengthening of relations with the Muslim countries, especially Pakistan. "Mohammed Morsi, Egypt's new president, has many firsts – and 2 American children". Mcclatchydc. Levs, Josh (25 June 2012). "Egypt's new president: U.S.-educated Islamist". CNN. Retrieved 24 June 2012.
el-Natroun, Wadi. "Wadi el-Natroun Prison located at the kilometer 97, on Alexandria-Cairo Highway, 100 kilometers North West of Cairo, Egypt. It is the state prison that hosted political prisoners among them were the 34 Muslim Brothers who escaped on 30 January 2011". "How Morsi escaped... from the prison". All voices. Archived from the original on 15 June 2013. Retrieved 22 April 2013. ^ The spellings of his first and last names vary. A survey of 14 news organizations plus Wikipedia in July 2012 (archive at Wayback Machine) found that 11 used "Mohamed" and four used "Mohammed"; nine used "Morsi", five used "Mursi", and one used "Morsy". The official Egypt State Information Service uses both "Morsi" and "Morsy". ^ Barakat, Dana; Sullivan, Thomas (26 August 2013). "Jordan Bolstered by Egyptian, Syrian Chaos". Sharnoff's Global Views. Retrieved 30 August 2013. ^ "Egypt's army chief Abdel Fattah al-Sisi receives a promotion ahead of likely presidency bid". Australian Broadcasting corporation. January 28, 2014. Retrieved May 4, 2015. ^ Sheikh, David D. Kirkpatrick and Mayy El. "President Morsi in Egypt Seizes New Powers". Retrieved 19 June 2018. ^ El Rashidi, Yasmine (7 February 2013). "Egypt: The Rule of the Brotherhood". New York Review of Books. Retrieved 24 September 2013. The Islamists' TV channels and press called the completion of the draft constitution an 'achievement', 'historic', 'an occasion', 'another step toward achieving the goals of the revolution'. The independent and opposition press described it as 'an Islamist coup'. ^ a b c "Egypt's Mursi annuls controversial decree, opposition says not enough". Al Arabiya. 9 December 2012. Archived from the original on 9 December 2012. Retrieved 9 December 2012. The two issues – the decree and the referendum – were at the heart of anti-Mursi protests that have rocked Egypt in the past two weeks. ^ Williams,, Daniel (15 August 2013). "Muslim Brotherhood abuses continue under Egypt's military". The Washington Post. Archived from the original on 27 September 2013. Retrieved 22 August 2013. ^ David D. Kirkpatrick (26 April 2012). "President Mohamed Morsi of Egypt Said to Prepare Martial Law Decree". The New York Times. Egypt. Retrieved 8 December 2012. ^ McCrumen, Stephanie; Hauslohner, Abigail (5 December 2012). "Egyptians take anti-Morsi protests to presidential palace". The Independent. London. Retrieved 5 December 2012. ^ "Egypt's Morsi rescinds controversial decree". Al Jazeera. 9 December 2012. Retrieved 30 September 2017. ^ "Egypt's constitution passes with 63.8 percent approval rate". Egypt Independent. 25 December 2012. Retrieved 30 September 2017. ^ Alsharif, Asma (30 June 2013). "Millions flood Egypt's streets to demand Mursi quit". Reuters. ^ Kelley, Michael (30 June 2013). "Sunday Saw 'The Biggest Protest In Egypt's History'". San Francisco Chronicle. ^ "Millions March in Egyptian Protests". The Atlantic. 1 July 2013. ^ Abdelaziz, Salma (1 July 2013). "Egyptian military issues warning over protests". CNN. Retrieved 1 July 2013. ^ "Morsi told he is no longer the president". The Washington Post. Archived from the original on 8 December 2018. Retrieved 3 July 2013. ^ Weaver, Matthew; McCarthy, Tom (3 July 2013). "Egyptian army suspends constitution and removes President Morsi – as it happened". The Guardian. Retrieved 10 July 2013. ^ Hendawi, Hamza; Michael, Maggie (2 July 2013). "Outlines of Egypt army's post-Morsi plan emerge". Associated Press. Retrieved 2 July 2013. ^ Kingsley, Patrick (16 August 2014). "Egypt's Rabaa massacre: one year on". The Guardian. Retrieved 30 September 2017. ^ "ElBaradei quits as Egypt vice president in protest at crackdown". Reuters. 14 August 2013. Retrieved 30 September 2017. ^ a b c "Mohammed Morsi death sentence overturned". BBC. 15 November 2016. Retrieved 16 November 2016. 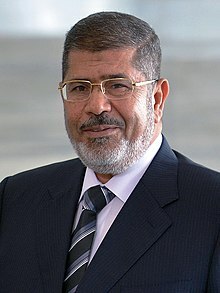 ^ a b "Profile: Egyptian presidential frontrunner Mohamed Mursi". Asharq Alawsat. 25 May 2012. Retrieved 5 April 2013. ^ "Muhammad Morsi: An ordinary man". The Economist. 30 June 2012. Retrieved 27 November 2012. ^ "Who is Mohamed Morsi? - Presidential elections news - Presidential elections 2012 - Ahram Online". ahram.org.eg. ^ CNN Library (28 December 2012). "Mohamed Morsy Fast Facts". CNN. ^ David Matthews (19 July 2012). "Academic-turned-politician aims to fix engine of state". The Times of Higher Education. Archived from the original on 13 August 2012. Retrieved 12 August 2012. ^ Driggs, Alexis (26 June 2012). "Egyptians elect USC alumnus". Daily Trojan. Retrieved 22 September 2012. ^ Mertz, Ed (2012-06-25). "Egyptian President-Elect Has Ties To USC, CSUN". KNX (CBS News). Retrieved 27 July 2013. ^ a b Katherine Jane O'Neill (12 April 2013). "How Morsi's English 'destroyed' his US students". Saudi Gazette. Archived from the original on 1 October 2015. ^ El Sheikh, Mayy; Kirkpatrick, David D (27 June 2012). "Egypt's Everywoman Finds Her Place is in the Presidential Palace". The New York Times. Archived from the original on 12 August 2012. Retrieved 12 August 2012. ^ Knell, Yolande (24 June 2012). "Egypt president: Muslim Brotherhood's Mohammed Mursi". BBC News. Archived from the original on 12 August 2012. Retrieved 12 August 2012. ^ "Morsy calls for a national uprising to save Al-Aqsa Mosque". Ikhwan Web. ^ Birmbaum, Ben (31 May 2012). "Top Egyptian presidential candidate doubts al Qaeda role in 9/11". The Washington Times. ^ Hamid, Shadi (7 June 2012). "Brother Number One". Foreign Policy. ^ Satloff, Robert; Trager, Eric (11 September 2012). "Getting Egypt's Morsi to give up his 9/11 'truther' talk". The Washington Post. Retrieved 27 September 2012. ^ "Mohamed Morsi - Meet the candidates - Presidential elections 2012 - Ahram Online". ahram.org.eg. ^ Reuters (30 January 2011). "Egypt Muslim Brotherhood says 34 key members escape prison". Reuters. ^ Tisdall, Simon (30 January 2011). "Egypt protests: Cairo prison break prompts fear of fundamentalism". The Guardian. London. ^ Hennessy-Fiske, Molly (30 January 2011). "Egypt: Muslim Brotherhood members escape prison, rally in Tahrir Square". Los Angeles Times. Retrieved 30 September 2017. ^ a b "Update: Morsi, Badie sentenced to death in "prison break case"". The Cairo Post. 16 May 2015. Retrieved 16 May 2015. ^ "Egypt Brotherhood candidate: army wants to retain power". Al Akhbar. Agence France-Presse. 18 April 2012. Retrieved 12 August 2012. ^ Perry, Tom. Newsmaker: Egypt's Morsy goes from prisoner to president. MSNBC. Original published by Reuters. 24 June 2012. ^ "Dr. Morsi Presidential Campaign Kickoff in Mahalla Al-Kubra on May Day" (full coverage). Ikhwanweb. 1 May 2012. ^ Hiel, Betsy (20 May 2012). "Muslim Brotherhood's rhetoric reveals intent in Egypt". TribLive. Retrieved 30 May 2012. ^ Atulenaja, Atul (30 May 2012). "Egypt's Islamists seek 'grand coalition' with liberals, minorities". The Hindu. Chennai, India. Retrieved 30 May 2012. ^ "Morsy demands Okasha be banned from TV". Egypt Independent. 30 May 2012. Archived from the original on 31 May 2012. Retrieved 30 May 2012. ^ Sterling, Harry (10 June 2012). "Sterling: Gauging Muslims' ability to leave their faith". The Calgary Herald. Archived from the original on 13 August 2012. Retrieved 12 August 2012. ^ "Awards". Alwafd. Retrieved 24 March 2013. ^ "Muslim Brotherhood's Mursi declared Egypt president". BBC News. 24 June 2012. Archived from the original on 13 August 2012. Retrieved 12 August 2012. ^ Fathi, Yasmine (24 June 2012). "Brotherhood campaigners elated as Mursi is named Egypt's next president". Al Ahram. Retrieved 12 August 2012. ^ with Dr. Mohammed Morsy, president of Egypt's 'Freedom and Justice' party. [permanent dead link] France 24. Retrieved May 2011. ^ "Mohamed Morsi sworn in as Egypt's first popularly-elected president". CNN. 30 June 2012. Retrieved 30 June 2012. ^ Conal Urquhart (30 June 2012). "Mohamed Morsi sworn in as Egyptian president". The Guardian. London. Retrieved 1 July 2012. ^ Hamza Hendawi (16 June 2012). "Egypt votes for president to succeed Mubarak". Google. Associated Press. Retrieved 1 July 2012. ^ Hamid, Shadi (7 June 2012). "Brother Number One". Foreign Policy. Archived from the original on 30 June 2012. Retrieved 26 June 2012. ^ Fleishman, Jeffrey (25 January 2012). "Egypt's Mohammed Morsi moves into Mubarak's presidential office, meets with military". Toronto Star. Retrieved 12 August 2012. ^ "Egypt's Morsi at Tahrir Square: Power of the people is above all". Haaretz. Reuters and Associated Press. 29 June 2012. Archived from the original on 13 August 2012. Retrieved 12 August 2012. ^ David D. Kirkpatrich (29 June 2012). "Egypt's New Leader Takes Oath, Promising to Work for Release of Jailed Terrorist". The New York Times. Archived from the original on 13 August 2012. Retrieved 12 August 2012. ^ Hendrix, Steve; Londoño, Ernesto (8 July 2012). "Egypt's Morsi makes bid to reinstate Islamist parliament". The Washington Post. Retrieved 8 July 2012. ^ Watson, Ivan (10 July 2012). "Egyptian parliament to convene in defiance of generals". CNN. Retrieved 12 August 2012. ^ Mourad, Sarah (28 June 2012). "Egypt to see first female, Coptic vice-presidents: Morsi team". Al Ahram. Retrieved 12 August 2012. ^ "Vice president quits as Egypt votes on constitution". Reuters. 22 December 2012. Retrieved 22 December 2012. ^ "Egypt's Morsi names new prime minister". Al Jazeera. 24 July 2012. Archived from the original on 12 August 2012. Retrieved 12 August 2012. ^ Wahba, Abdel Latif; El-Tablawy, Tarek (2 August 2012). "Egypt's New Government Prepares to Take Helm of Nation". Bloomberg L.P. Archived from the original on 12 August 2012. Retrieved 12 August 2012. ^ "Egyptian President Morsi Rejects Previous Limits on Presidential Power". PBS. 13 August 2012. Retrieved 14 August 2012. ^ "Profile: Egypt armed forces chief Abdul Fattah al-Sisi". BBC News. 2013-07-03. Retrieved 2013-07-05. ^ "Egypt leader Mursi orders army chief Tantawi to resign". BBC News. 12 August 2012. Retrieved 12 August 2012. ^ a b "Egypt's president asserts authority over army". Al Jazeera. 12 August 2012. Archived from the original on 12 August 2012. Retrieved 12 August 2012. ^ a b Kareem Fahim (12 August 2012). "Egyptian Leader Ousts Military Chief". The New York Times. Retrieved 12 August 2012. ^ Elyan, Tamim (14 August 2012). "Egypt's Mursi faces lawsuit over removal of power curbs". Reuters. Retrieved 14 August 2012. ^ Michael, Maggie. "Egypt President names mainly Islamist adviser team". Associated Press. Retrieved 28 August 2012. ^ Mazel, Zvi (23 August 2012). "Analysis: Brotherhood taking total control of Egypt". The Jerusalem Post. Retrieved 13 December 2012. ^ "Egypt sees revenue in Suez Canal corridor project". Reuters. Retrieved 7 August 2014. ^ "Egypt President Morsi wants India to join Suez Canal corridor project". India TV. Retrieved 7 August 2014. ^ "New Suez Canal project proposed by Egypt to boost trade". Cairo News.Net. Retrieved 7 August 2014. ^ "In Public Prayer Morsi Appeals to Allah to 'Deal with the Jews' (Video)". Jewish Press. 22 October 2012. Retrieved 13 December 2012. ^ "Al-Ahram: The Jews Caught a Fat Fish with Morsi's Hate Video". Jewish Press. 25 October 2012. Retrieved 13 December 2012. ^ Kumar, Anugrah (19 November 2012). "Egypt's New Coptic Pope Enthroned in President Morsi's Absence". CP World. Retrieved 26 January 2013. ^ a b Kirkpatrick, David (24 November 2012). "Morsi Urged to Retract Edict to Bypass Judges". The New York Times. Archived from the original on 25 November 2012. Retrieved 24 November 2012. ^ "Rallies for, against Egypt president's new powers". ABC News. Associated Press. 23 November 2012. Archived from the original on 25 November 2012. Retrieved 25 November 2012. ^ El Baradei, Mohamed (22 November 2012). "Twitter". Retrieved 23 November 2012. ^ "Egypt unrest: Anti-Mursi protests intensify". BBC News. 24 November 2012. Retrieved 24 November 2012. ^ Kareem Fahim; David Kirkpatrick (23 November 2012). "Clashes Break Out After Morsi Seizes New Power in Egypt". The New York Times. Retrieved 30 September 2017. ^ "Tea and tear gas in Tahrir Square". Amnesty International. 2012-11-19. ^ "Egypt: President Morsi changes to the constitution trample rule of law". UK: Amnesty International. Archived from the original on 30 November 2012. ^ "Denounces Morsi Power-Grab in Egypt". Freedom House. ^ "Egypt: Morsy Decree Undermines Rule of Law". Human Rights Watch. 2012-11-26. ^ Batrawy, Aya (24 November 2012). "Egypt's top judges slam president's new powers". Google News. Associated Press. Archived from the original on 25 November 2012. Retrieved 24 November 2012. ^ "Egyptian president says decree granting new powers 'temporary,' calls for dialog". RT. 25 November 2012. Retrieved 25 November 2012. ^ Bradley, Matt; Dagher, Sam (28 November 2012). "Cairo Impasse Raises Economic Alarms". The Wall Street Journal. Retrieved 28 November 2012. ^ "Egypt: Who holds the power?". BBC News. 27 November 2012. Retrieved 1 December 2012. ^ "Egypt to hold December referendum on new constitution". BBC News. 1 December 2012. Retrieved 1 December 2012. ^ a b "Morsi's decree cancelled, constitution referendum to take place on time". Ahram Online. 9 December 2012. Retrieved 8 December 2012. ^ Saleh, Yasmine; Awad, Marwa (4 December 2012). "Egypt's Mursi leaves palace as police battle protesters". Reuters. Retrieved 4 December 2012. ^ McCrummen, Stephanie (8 December 2012). "Egypt's Morsi annuls most of contested decree, stays firm on Dec. 15 referendum". The Washington Post. Retrieved 30 December 2012. ^ Kirkpatrick, David D. (28 December 2012). "Backing Off Added Powers, Egypt's Leader Presses Vote". The New York Times. Egypt. Retrieved 30 December 2012. ^ "Egypt's Morsi rescinds controversial decree". Al Jazeera. 9 December 2012. Retrieved 30 December 2012. ^ "Egypt crisis: Morsi offers concession in decree annulment". BBC News. 9 December 2012. Retrieved 30 December 2012. ^ al-Qazzaz, Khaled, "Why Is the World Silent? ", op-ed, New York Times, 27 June 2014. Retrieved 2014-06-28. ^ Ezzat, Dina (12–18 July 2012). "Destination Riyadh". Al Ahram Weekly. 1106. Archived from the original on 30 April 2013. Retrieved 22 April 2013. ^ "Morsy to seek closer ties with Saudi Arabia". The Hindu. Chennai, India. 11 July 2012. Retrieved 12 August 2012. ^ a b Theodoulou, Michael. Islamists' jubilant but some are wary of Morsi The National. 12 June 2012. ^ Viktor Kotsev (14 August 2012). "A Brotherhood coup in Egypt". Asia Times. Retrieved 14 August 2012. ^ a b c d "Morsi role at Syria rally seen as tipping point for Egypt army". The Irish Times. 2013-07-02. Retrieved 2013-07-03. ^ Perry, Tom (15 June 2013). "Mursi cuts Egypt's Syria ties, backs no-fly zone". Reuters. Retrieved 30 September 2017. ^ "Egypt seen to give nod toward jihadis on Syria". Salon. 2013-06-17. Retrieved 2013-07-03. ^ "Egypt and Iran: Pious politics". The Economist. 4 May 2013. Retrieved 30 September 2017. ^ "Morsi's office confirms warm letter to Peres is authentic". The Times of Israel. 18 October 2012. Retrieved 27 October 2012. ^ Ilan Ben Zion; Elhanan Miller (31 July 2012). "Morsi denies sending friendly letter to Peres". The Times of Israel. Retrieved 27 October 2012. ^ Tzvi Ben Gedalyahu (25 June 2012). "Cairo Gov't Conceived in Violence, Bred in Chaos". Arutz Sheva. Archived from the original on 13 August 2012. Retrieved 12 August 2012. ^ Peter Beaumont (14 November 2012). "Egypt condemns Israeli air strikes in Gaza and demands ceasefire". The Guardian. London. Retrieved 15 November 2012. ^ "Israel Hits Hamas PM's Office, Readies Troops". The Wall Street Journal. 17 November 2012. Retrieved 21 November 2012. ^ "Egypt PM to visit Gaza on Friday". Agence France-Presse. 17 November 2012. Retrieved 21 November 2012. ^ Nisman, Daniel (19 November 2012). "Why Morsi Could Be the Gaza Conflict's Biggest Loser". The Huffington Post. Retrieved 21 November 2012. ^ "Cease-fire reached in Gaza conflict". CNN. 21 November 2012. Retrieved 21 November 2012. ^ Behar, Richard (11 January 2013). "News Flash: Jews Are 'Apes And Pigs.' So Why Is Egypt's Morsi The Elephant In America's Newsrooms?". Forbes. Retrieved 1 February 2013. ^ "Egypt's Morsi, in 2010 interviews posted online, called Zionists 'bloodsuckers' and descendants of pigs, urged to sever all ties with Israel". The Times of Israel. 4 January 2013. ^ "Morsi in 2010: No to Negotiations with the Blood-Sucking, Warmongering "Descendants of Apes and Pigs"; Calls to Boycott U.S. Products". Memri TV. ^ "Zionists are bloodsuckers and warmongers: Morsi in 2010 video". IR: Press TV. 6 January 2013. ^ "Morsi called Israelis 'descendants of apes and pigs' in 2010 video". Haaretz. JTA. 4 January 2013. ^ "Morsi: No peace with descendants of apes and pigs". The Jerusalem Post. 4 January 2013. ^ Kirkpatrick, David D. (2013-01-15). "Morsi's Slurs Against Jews Stir Concern". The New York Times. ^ a b "McCain chides Egypt's Morsi over remarks on Jews". ^ a b "Mohamed Morsi Comments On Jews 'Taken Out Of Context', Says Egypt Spokesman". The Huffington Post. 16 January 2013. Archived from the original on 18 January 2013. Retrieved 16 January 2013. ^ "Offensive remarks about Jews were taken out of context, Egypt's president insists during Germany visit". National Post. Associated Press. 30 January 2013. ^ Hamza Hendawi (15 July 2012). "Egypt's Morsi in Ethiopia for AU summit". Yahoo News. Associated Press. Archived from the original on 12 August 2012. Retrieved 12 August 2012. ^ "Egypt President to Visit Iran". The Daily Beast. Retrieved 18 August 2012. ^ "Morsi Claims against Syrian Government". Parsine (in Persian). Retrieved 30 August 2012. ^ "Morsi criticises Syria at Tehran Meeting". 30 August 2012. ^ "Islamic summit backs Mali government, omits France". Ahram Online. Reuters. 8 February 2013. Retrieved 24 March 2013. ^ Saleh, Yasmine (7 February 2013). "Islamic summit urges dialogue on Syria transition". Reuters. Retrieved 24 March 2013. ^ "وزير الإعلام السعودي السابق إياد مدني أمينا لمنظمة التعاون الإسلامي - روسيا اليوم". RT. Archived from the original on 11 February 2013. Retrieved 24 March 2013. ^ "Egypt crisis: Mass protests over Morsi grip cities". BBC News. 1 July 2013. Retrieved 17 May 2015. ^ Umar Farooq (30 June 2013). "Seeking New Leadership, Millions of Egyptians Take to the Streets". The Atlantic. ^ Patrick Werr (1 July 2013). "Four Egyptian ministers resign after protests: cabinet official". Reuters. Retrieved 1 July 2013. ^ "Egypt crisis: President Morsi rejects army ultimatum". BBC News. 2 July 2013. Retrieved 2 July 2013. ^ Coup topples Egypt's Morsy; supporters reportedly rounded up - CNN.com. Edition.cnn.com. Retrieved on 2013-08-14. ^ "Egypt PM Qandil addresses resignation to Morsi, slams military coup". The Journal of Turkish Weekly. 9 July 2013. Archived from the original on 14 March 2016. Retrieved 30 September 2017. ^ "Profile: Morsi Kidnapped". The Jerusalem Post. 13 November 2013. Retrieved 11 December 2013. ^ "Profile: Morsi Kidnapped". Press TV. 14 November 2013. Archived from the original on 18 December 2013. Retrieved 11 December 2013. ^ Goyette, Braden (13 November 2013). "Morsi Claims He Was Kidnapped Before Ousting". Huffington Post. ^ a b "Egypt Army Hiding Morsi In Secret Location, Extreme Measures Taken To Keep Detention Site Hidden". Huffington Post. 31 July 2013. ^ "Catherine Ashton Meets With Mohammed Morsi, Says Egypt's Ex-President Doing Well". Huffington Post. 30 July 2013. ^ "Ousted Egypt leader Morsi in good health, says EU's Ashton". BBC News. 30 July 2013. ^ "EU's Catherine Ashton meets with Mohammed Morsi: 'He is well'". ^ "Egypt starts Morsi trial for leaking documents to Qatar". Ahram Online. 15 February 2015. Retrieved 30 September 2017. ^ "Morsi Charges (Arabic)". 22 December 2013. Retrieved 30 September 2017. ^ Sadek, George (April 2014). "Egypt: Pending Charges Against Mohammed Morsi" (PDF). gpo.gov. Law Library of Congress. Retrieved 30 September 2017. ^ a b El Deeb, Sarah (1 September 2013). "Egypt's Morsi to be tried for inciting violence". USA Today. Retrieved 30 September 2017. ^ "Egypt sets November trial date for Morsi". Al Jazeera. 10 October 2013. Retrieved 30 September 2017. ^ Abdallah, Abdel (18 December 2013). "Prosecutor General orders Morsi tried for espionage along with Brotherhood leaders". Daily News Egypt. ^ Kingsley, Patrick (28 January 2014). "Mohamed Morsi defiant in face of jailbreak and conspiracy charges". The Guardian. Retrieved 30 September 2017. ^ Louisa Loveluck (4 February 2014). "Egypt's interim leader says end to 'pharaoh presidents' as Morsi trial resumes". The Daily Telegraph. London. ^ "Egypt's Morsi trial adjourned to March 1". Yahoo News. 5 February 2014. Retrieved 30 September 2017. ^ "Egypt's Morsi trial adjourned to May 17". APA. 7 May 2014. Archived from the original on 5 June 2014. Retrieved 1 June 2014. ^ Aaron Rose (19 May 2014). "Morsi prison break trial resumes". Daily News Egypt. ^ Bill Chappell (21 April 2015). "Egypt's Former President Morsi Sentenced To 20 Years In Prison". National Public Radio. Retrieved 22 April 2015. ^ Jared Malsin; Owen Bowcott (21 April 2015). "Egypt's former president Mohamed Morsi sentenced to 20 years in prison". The Guardian. Retrieved 30 September 2017. ^ "Mohammed Morsi, Egypt's ousted president, sentenced to death". Times of India. 16 May 2015. Retrieved 30 September 2017. ^ "Mohammed Morsi: Egypt's former president given life in spying case". BBC News. June 18, 2016. Retrieved June 19, 2016. ^ Hendawi, Hamza (18 June 2016). "Egyptian court sentences 2 Al-Jazeera employees to death". Associated Press. Retrieved 30 September 2017. ^ "Mohamed Morsi life sentence quashed by Egypt court". Middle East Eye. 22 November 2016. Retrieved 30 September 2017. ^ World Digest (October 11, 2018). "Police detain former president's youngest son". Washington Post. ^ Mayy El Sheikh (27 June 2012). "Egypt's Everywoman Finds Her Place is In The Presidential Palace". The New York Times. Retrieved 25 November 2012. ^ Aya Batrawy (28 June 2012). "Morsi's wife prefers 'first servant' to first lady". The Globe and Mail. Toronto. Archived from the original on 2 July 2012. Retrieved 2 July 2012. ^ "Egyptian president's son is Saudi-based urologist". Asharq Alawsat. 26 June 2012. Retrieved 5 April 2013. ^ a b "Son of Egypt's President-elect Mursi to resume medical career in Saudi Arabia". Al Arabiya. 27 June 2012. Archived from the original on 24 August 2012. Retrieved 12 August 2012. ^ Tom Perry (24 June 2012). "Newsmaker: Egypt's Morsy goes from prisoner to president". Reuters. Retrieved 12 August 2012. ^ "No competition". Al Ahram. 20 February 2013. Retrieved 21 February 2013. ^ "Omar Morsi criticised for rejecting job". The Voice of Russia. 7 April 2013. Retrieved 18 February 2013. ^ "Omar Morsi rejects the job". Boswtol. 7 April 2013. Retrieved 17 February 2013. ^ "NUST awards honourary doctorate degree to Egyptian President Mohamed Morsi". 18 March 2013. Archived from the original on 22 February 2014. Retrieved 19 March 2013. ^ "Morsi gets an honourary doctorate". 18 March 2013. Retrieved 19 March 2013.